Pound Vs. Euro: Tie Game for Now? While I’m fondest of analyzing all currencies relative to the Dollar (after all, it’s what I’m most familiar with and is involved in almost half of all forex trades), sometimes its interesting to look at cross rates. Take the Pound/Euro, for example, arguably one of the most important crosses, and one of a handful that often moves independently of the Dollar. If you chart the performance of this pair over the last two years, however, you can see the distinct lack of volatility. 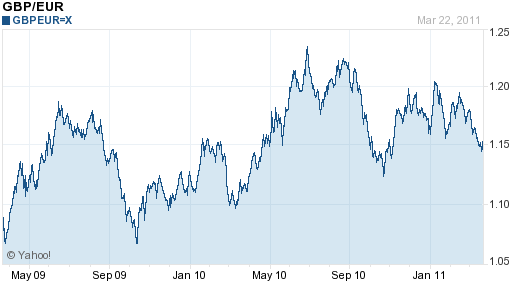 It has fluctuated around an axis of 1.15 GBP/EUR, never straying more than 5% in either direction. In fact, it’s sitting right at this level as I compose this post. Yesterday, I read some commentary by Boris Schlossberg (whom I interviewed in 2010), Director of Currency Research at GFT. In the title (“Euro and Pound Go Their Separate Ways”), he seemed to suggest that a big move was imminent. Aside from noting that both currencies stand at crossroads, he declined to offer more concrete guidance on the direction of the potential breakout. At the moment, the markets are gripped by risk aversion, caused by the Mid East political turmoil and the Japanese natural disasters. Once these events run their course and the accompanying market tension subsides, investors will need something else to latch on to. 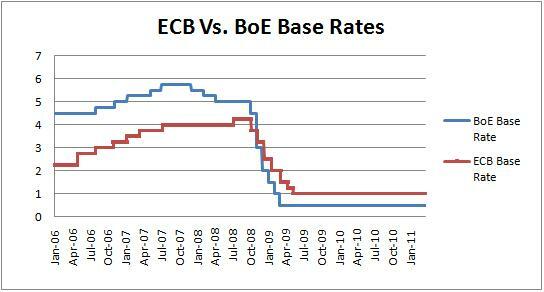 Perhaps the Bank of England (BoE) and European Central Bank (ECB) can fulfill this function, since both are on the verge of hiking their respective benchmark interest rates . Absent any other developments, the timing and speed of such hikes will probably dictate not only how these currencies perform against each other, but also how they perform against the Dollar. Despite the numerous indications that both have given to the contrary, I don’t think either Central Bank is in a hurry to raise interest rates. Economic growth remains poor, unemployment is high, and inflation is still moderate. Neither is yet at the stage where it can unwind the monetary easing that it put in place at the height of the financial crisis. Moreover, both are wary about the potential impact of rate hikes on their respective currencies (a concern that I am ironically fomenting with this post). It looks like the BoE will be the first to act. Combined with high energy prices, the bank’s easy monetary policy is putting extraordinary pressure on prices, and it now appears that inflation could reach 5% in 2011. In addition, the BoE voted 6-3 at its last meeting in favor of tightening, which means that a hike probably isn’t too far off. On the other hand, the ECB is talking tough, but it still doesn’t have much of an impetus to act. Inflation is moderate, and besides, the region’s banks remain too dependent on ECB cash for it to serious contemplate being aggressive. Either way, the interest rate differential probably won’t be great enough to encourage any short-term speculation between the two currencies. In addition, I think investors will continue to look to the Yen and the Dollar for guidance, and we won’t see any significant movement in either direction. [The chart below is based on benchmark lending rates and isn’t necessarily applicable for retail forex trading]. This would create two opportunities for investors: Options traders should consider a long straddle, which involves selling a put and call at the same strike price (perhaps 1.15), pocketing the premiums, and praying that the rate doesn’t fluctuate much (since they would be exposed to unlimited risk). In the future, carry traders can also profit from the lack of volatility through a carry trading strategy, perhaps amplified by a little leverage. Be careful, however. Since interest rate differentials are currently so small (The current LIBOR rate disparity is a mere .05%!) and probably won’t widen to more than 1% over the next twelve months, any profits from interest could easily be wiped out by even the smallest adverse exchange rate movements. Technically, if you zoom out the EUR/GBP chart a bit you’ll see two clearly-defined multi-year price patterns: a downward-sloping channel and a symmetrical triangle, both starting sometime in late 2008, during the nadir of the financial crisis. We’re approaching the upper trendlines of both the channel and the triangle so we could soon see some interesting medium-term movements either way, whether the price respects the channel or breaks out of the triangle. Fundamentally, even though the UK & EZ are equally boned the British have a (relatively) united and functioning government that is actually doing something to tackle their country’s financial problems while the European governments keep disagreeing and procrastinating. Therefore I’m bearish EUR/GBP over the next few months. The trigger might actually come from the recent Portugal downgrade, if it gets blown way out of proportion and Portugal goes the way of Greece.